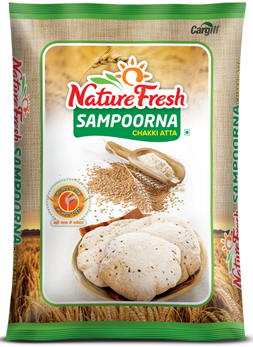 Nature Fresh flour is made from the finest quality wheat grains. Nature Fresh prides itself on its selection of high quality, natural ingredients that are processed right, to produce atta that is just the right texture – neither too fine, nor too coarse. This ensures that the rotis turn out to be softer and fluffier. The bran ensures that the atta retains the natural dietary fibers that make the rotis easy to digest and provide optimum nutrition to the consumer. Atta made from the choicest of wheat, selected and blended by experts for perfect color and texture thereby delivering soft and fluffy rotis.Cargill has been able to leverage its legendary expertise in procuring the right grains and seeds, perfected over 150 years across the globe. A high fibre diet leads to numerous health benefits; balanced blood sugar and cholesterol levels, prevention from heart diseases, prevention from colon cancer, weight management, clean digestive system, body toxins' and waste disposal and clear skin among others. Wheat is a member of the grass family that produces a dry, one-seeded fruit commonly called a kernel. The Roman goddess, Ceres, who was deemed protector of the grain, gave grains their common name today – "cereal." Wheat originated in the "cradle of civilization" in the Tigris and Euphrates river valley, near what is now Iraq.